Windsor Castle was the second of two near identical ships designed for the Union Castle Line in 1913. Both ships were originally to be built at Harland & Wolff’s Belfast yard. With the escalation of World War One halting all work on civilian shipping, Harland & Wolff had only managed to start work on the first of the two ships Arundel Castle. The continuation of the war until late 1918 led to Harland & Wolff subcontracting the building of the second ship Windsor Castle to John Brown’s/Clydebank. With Windsor Castle being completed in 1922 to her original 1913 design, she was the last of fourteen four stackers built and looked like an old ship before entering service. Windsor Castle set out on her maiden voyage from Southampton - Cape Town in April 1922. This gave the Union Castle Line the two largest ships on that run to provide an alternating service between England and South Africa. Windsor Castle underwent the same type of rebuild as her sister ship Arundel Castle at Harland & Wolff in 1937. Two years later, the British Admiralty requisitioned both ships to serve as troopships. While Windsor Castle was steaming off the west coast of Ireland November 4th 1940, one 500lb bomb from a German aircraft attack crashed into her first class smoking room. The failure of the bomb to explode gave dockworkers at Greenock/Scotland the delicate task of removing it the following day. While on a troop-carrying voyage from Greenock to the Mediterranean in 1943, German aircraft located her approximately 110 miles northwest of Algiers on March 23rd. The one torpedo that found its target in the attack that followed caused enough damage to force her crew and servicemen to abandon ship. 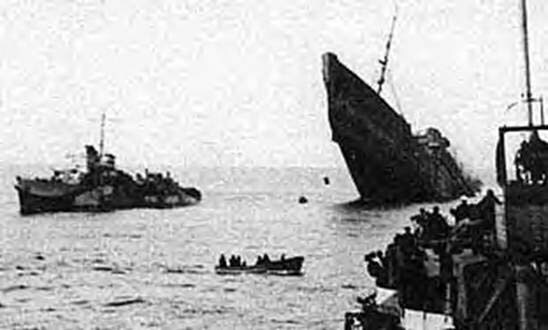 Windsor Castle stayed afloat for thirteen hours allowing all but one of the 291 crew and 2,699 servicemen on board to be rescued. With rescue ships all around, Windsor Castle’s bow rose hundreds of feet into the air as she sank stern first into the Mediterranean Sea.